After three tough losses to Mary Washington, Salisbury, and Millsaps College to start off their spring season, Franklin & Marshall Women’s Tennis rallied together to win their next three games. They dominated against Ithaca (7-2) and won an intense battle against Ohio Wesleyan (6-3). After defeating Ursinus (6-3), the Diplomats earned a 3-3 record overall. The Diplomats faced off against Ursinus on March 21 at Ursinus College compete against their first Centennial Conference opponent. Going into the match, the Ursinus Bears were 4-4. First singles and one of the senior leaders for the Diplomats, Allison Wolters, defeated her competitor, Caitlyn Sorelle, 6-2, 6-2. Wolters has been in the first singles position since her sophomore year. She has played consistently strong for the Diplomats and is looking to finish off her career on a high note. After losing three close matches against Mary Washington, Salisbury, and Millsaps College to start the 2019 season, Wolters rebounded and has decisively beaten her following three singles opponents. F&M’s second senior leader, Gavriel Rubenstein, lost a close match in her second singles competition against Maddie Russell, 7-5, 7-5. This season, Rubenstein has stepped up into a bigger role on the team in the second singles position as she had previously played in the third singles position in the 2017-2018 season. Although Rubenstein lost a tight battle, the dynamic duo of Wolters and Rubenstein defeated their competitors in the first doubles competition against Sorelle and Brenna Trkula. In the third, fourth, and fifth singles competition, all three Diplomat players defeated their opponents. In the third singles position, senior Emma Wu dominated her opponent Trkula 6-1, 6-1. In the fourth singles match, first-year Lauren Wang remained in control throughout the match and defeated her opponent, 6-1, 6-3. However, Wu and Wang lost a hard-fought battle in the second doubles competition 8-6 against Russell and Freedman for the Bears. In the fifth singles competition, sophomore Alex D’Angelo defeated Madisen Harvey in a close 8-6 match. Wu, Wang, and D’Angelo have all won their last three matches against their singles competitors. In the sixth singles position, the Diplomats’ Marissa Witmer lost to Cara Freedman 8-3. However, the tag team of D’Angelo and Witmer played well together and defeated Jessica Leach and Harvey in their third doubles competition. After their win against Ursinus, the Diplomats are 1-0 in the conference. The Diplomats hope to continue their strong performance win streak in their upcoming matches. 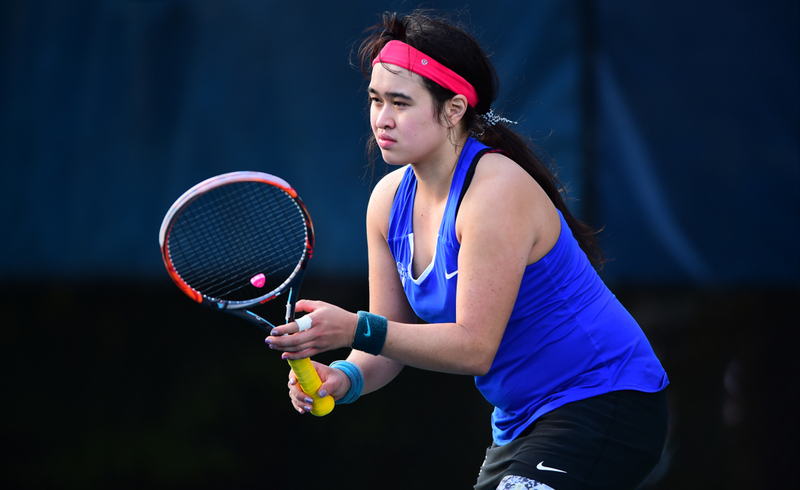 Franklin & Marshall Women’s Tennis will play their second conference matchup against Haverford (0-4) on Saturday, March 30 at 12:00pm at Franklin & Marshall College.